From the PBS series, "The Rise and Fall of Jim Crow," by Richard Wormser -- The Populist movement was a revolt by farmers in the South and Midwest against the Democratic and Republican Parties for ignoring their interests and difficulties. For over a decade, farmers were suffering from crop failures, falling prices, poor marketing, and lack of credit facilities. Many farmers were in debt due to a drought that affected the Midwest in the 1880s. At the same time, prices for Southern cotton dropped. These disasters, combined with resentment against railroads, money-lenders, grain-elevator owners, and others with whom farmers did business, led farmers to organize. As a result, two organizations came into existence during this period: the segregated National Farmers' Alliance and the Colored Farmers' Alliance. Although they came to win some significant regional victories, the alliances achieved little influence on a national scale. By the 1890s, agrarian reformers refocused their energies and organized the new Populist, or People's Party. The Party called upon the federal government to buffer economic depressions, regulate banks and corporations, and help farmers who were suffering hard times. 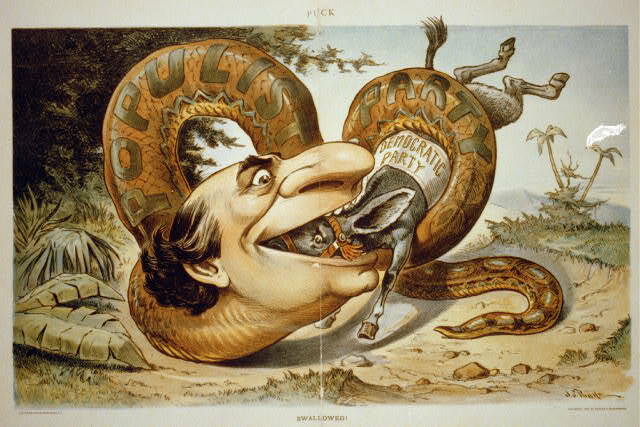 In 1892 the Populist presidential candidate, James B. Weaver, won more than 1,000,000 popular votes. The party elected several members to Congress, three governors, and hundreds of minor officials and legislators, nearly all in the Midwest. In the South, they challenged white supremacy by forming coalitions with black farmers in common cause. The coalitions won a number of elections in certain areas and captured the state of North Carolina in 1896 under the leadership of Marion Butler. In Georgia, Tom Watson led the Populist revolt against the Democratic Party. Watson appealed to rural black voters by promising to respect their political and civil rights. Watson organized picnics, barbecues, and camp meetings and formed political clubs for blacks. But political cooperation did not mean socializing; blacks and whites sat separately when together. Yet that did not prevent them from cheering wildly when Watson spoke of their common plight: "You are made to hate each other because on that hatred is rested the keystone of the arch of financial despotism which enslaves you both. You are deceived and blinded because you do not see how this race antagonism perpetuates a monetary system that beggars you both. The colored tenant is in the same boat as the white tenant, the colored laborer with the white laborer and that the accident of color can make no difference in the interests of farmers, croppers and laborers."